A strange earthy, minty soft drink is the preferred soda of millions of Pennsylvanians. What is birch beer, and what makes it so good? Perhaps the defining quality of the cuisine of southeastern Pennsylvania, where I grew up, is a fierce opinion about small differences. An Italian hoagie must not, under any circumstances, contain mayonnaise; it must have olive oil. An Italian hoagie with mayo is incorrect. Also incorrect: a soft pretzel in a traditional pretzel shape. Philadelphia soft pretzels have a unique thin, rectangular, symmetrical shape with the knot right in the middle. A regular round soft pretzel is wrong — or worse, from New York. And so it is with the soda preferred by Pennsylvanians, including a strange reddish herbal soda I grew up drinking and didn’t realize was odd until I left. Birch beer is made using a similar process to root beer or sarsaparilla. Traditionally, it’s made from the bark of the birch tree, specifically the black birch, which is also known as the spice birch or sweet birch. The bark would be boiled in water for a long time, softening it and releasing its essential oils. The solids would be strained out and the solution fermented with yeast, usually resulting in what’s called a “small beer,” meaning a beer with only 2-3% alcohol. I called Andy Schlegel, the manager of Kutztown Bottling Works in Kutztown, Pennsylvania, which, under various owners, has been making and selling birch beer for decades. “We started making birch beer during Prohibition,” he says. “They used to bottle beer here in Kutztown, and with Prohibition they had to do something, so they started making their own line of sodas and birch beer happened to be the most popular one.” Birch beer isn’t unheard of in neighboring states like Maryland and New York, but it certainly isn’t common there the way it is in eastern Pennsylvania. “Around here, birch beer’s more popular than root beer,” he said. The process of making it these days is a little different. Kutztown gets birch essential oils from a supplier in Maryland. The oils are usually made from the sap rather than the bark of the birch tree. They’re then mixed with simple syrup and some standard preservatives, and caramel color is added right at the end. “Naturally it would be a clear birch beer,” he says, but adding coloring is common. There are three colors of birch beer, which may or may not vary in flavor: red, brown, and clear. I grew up with the red kind, though there certainly were clear birch beers available in a non-gimmicky way (Crystal Pepsi it is not). 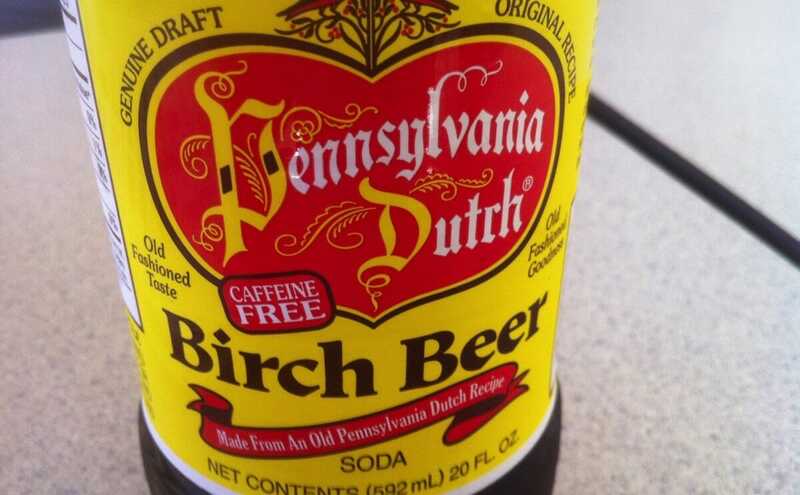 The Wikipedia entry for birch beer says “It has a taste similar to root beer.” This is offensive to me, as a southeastern Pennsylvania. Birch beer is significantly more complex and tastier than root beer. There is a lightness and freshness to it, an almost wintergreen or teaberry herbiness that leaves it tasting clean and crisp. There are compounds in the birch that give it a minty, spicy flavor, like the smell of the birch trees from which it came; the soda feels natural and primal, like it came from the earth and not from dudes in hairnets stirring vats. Root beer, made in a similar way but from the root of the unrelated sassafras tree (or, more often, synthetic extracts designed to taste like sassafras), tastes heavy, leaden, artificial, and cloyingly sweet in comparison. I can’t remember the last time I saw birch beer in a grocery store in New York City, but that’s kind of the way I want it. Birch beer tastes like Pennsylvania; it’s familiar but a little weird. Pennsylvanians have a firm preference for a slightly different version of a standard something the rest of the country is perfectly happy with. And like in so many cases in which a food veers from the norm, birch beer is great. Better than the norm, by a long shot. Try it, if you can get it. I actually grew up in Massachusetts drinking the clear variety you referred to, usually from Polar. It’s almost impossible to find in the south eastern states. If anyone has an interest in trying it but can’t locate it, I now get it from Walmart of all places. It’s listed on the website, and you can have it ordered to your local store to avoid shipping. The only catch is that requires a case of 12. I’ve found some folks don’t like it, but I think it’s one of the best non-alcoholic beverages I’ve ever tasted. I moved from Maryland to South Carolina a couple of years ago. When I asked a grocer here if he sold birch beer, his reply was “What’s that?”!